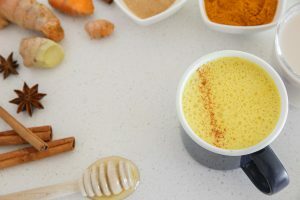 You might have heard of Golden Milk before, the turmeric health drink popular with health seekers for thousands of years. But, what is moon milk? You may remember when you couldn't sleep someone recommending a glass of warm milk. Well, this remedy has received a trendy upgrade and it's called Moon Milk. 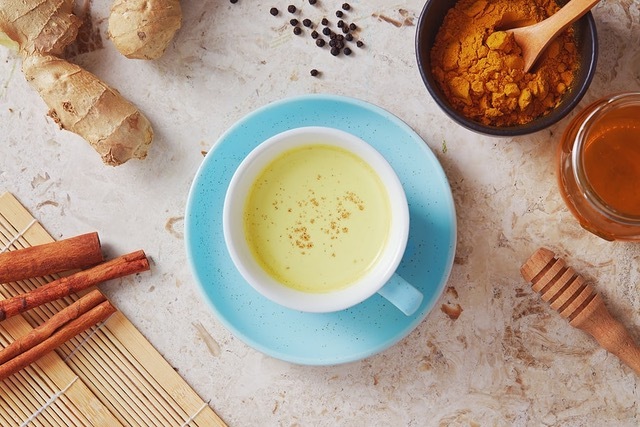 Moon milk is warm milk with nutmeg, cinnamon, Ashwagandha, turmeric, and honey. – all natural ingredients to calm and relax the body. Coconut oil is another option you can add to your moon milk. If you are one of the millions of people who have a hard time de-stressing, and dropping off to sleep easily, try including it in your night-time ritual. Milk in itself contains tryptophan and melatonin – natural substances that help people to fall asleep. The nutrients in moon milk are also known to be beneficial to your immune system. If the immune system is in good order, you can expect to fight off illnesses better. The primary adaptogen, Ashwagandha is the main ingredient of moon milk. Adaptogens are plants that support your adrenal glands. They help to balance your hormones so you can manage stress. They are derived from plants and which are nutrient-dense and help your body “adapt” to what it needs and help to protect against stressors. An adaptogen's job is to bring your body into balance. 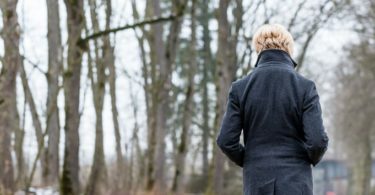 Adaptogens are unique in that they don’t just serve one function. The belief is that they actually can adapt to whatever your body is battling with. For example, it is known to lessen the symptoms of fatigue, anxiety, and stress. Ayurveda and Chinese healing have known the power of Adaptogens for thousands of years. Ashwagandha is one of the most widely used herbs for general debility in Ayurvedic medicine. A member of the nightshade family, Ashwagandha is also known as Indian ginseng. and Winter Cherry. When you are in a stressful situation, Ashwagandha helps your body adapt to the stressful condition. It offers calming effects, supporting the sleep cycle. It offers great support in times of stress and anxiety because it has proven to promote good levels of cortisol, the stress hormone. Ashwagandha also has anti-inflammatory processes which get stimulated when undergoing stress. It’s known as a ‘tonic’ and nourishing herb. It has a rejuvenating effect in that it helps to support and protect the nervous system and immune system and to improve energy. Ashwagandha also supports a healthy nervous system. It promotes calmness and a stable mood because the natural cortisol rhythms are regulated. Ashwagandha also supports cardiovascular health, and may also support healthy thyroid function as well. 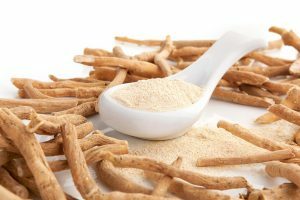 Consuming Ashwagandha root also seems to support healthy muscle strength and recovery time and is good for joint health too. In Ayurveda, Ashwagandha is known to promote longevity, happiness, and vitality. It is the go-to tonic for memory, hormonal function, and vitality. Another spice that makes up golden milk or moon milk is turmeric, one of the most used spices to fight inflammation. Turmeric (or Curcuma longa) is a relative of ginger and used medicinally for centuries. It is highly prized for its anti-inflammatory properties. The main component of turmeric is curcumin. Prevention of Cancer: Turmeric has the ability to reduce carcinogenic levels by as much as 40%. Prevention of Alzheimer’s disease: Turmeric forms a vital part of the Indian curries that they eat it on a daily basis. India has a low Alzheimer’s disease rate – less than one-fourth the rate of Alzheimer’s disease found in the US. It prevents skin cancer: Curcumin is noted to inhibit the growth of melanoma, a serious and potentially dangerous type of skin cancer. It relieves arthritis pain: Turmeric contains many anti-inflammatory compounds. Other popular spices you can use besides turmeric are nutmeg, cinnamon, cardamom, and allspice. Nutmeg and Cinnamon calming and warming. Cardamom helps with digestion problems. Allspice has terpenes that are antioxidant, anti-inflammatory and sedative. Even though the below superfoods are not typical ingredients, feel free to add them to supercharge your moon milk as a yummy way to get more nutrients into your body. Zhou Longevity Superfood powder: Just a spoonful of blue algae powder made from spirulina, the blue-green algae, which will give your moon milk its blue sea color and give you 15x more beta-carotene than carrots and up to 1.5x more calcium than milk, and more iron than spinach. Pomegranate: Pomegranate is a fruit that represents fertility and health and eternal life. Adding a scoop of pomegranate powder into your moon milk is a fabulous addition. Pomegranates have antioxidants and high vitamin c. It aids digestion problems and helps with arthritis, cancer and Alzheimer’s disease, among others. This Moon milk blends cinnamon and cardamom and with some coconut milk, with a splash of orange-flavored magnesium. Magnesium is an anti-stress nutrient good for nervous tension but unfortunately, our bodies do not produce this mineral so we need to replenish it regularly. What Type of Milk Should You Use? Even though cow's milk is often used in Moon Milk, you can substitute healthier plant-based milk alternatives. If you prefer cow's milk, Ayurveda teaches that you should boil it first because it helps with digestion. Cow’s Milk: In Ayurveda, drinking warm milk is a typical remedy to counter sleeplessness. Using cow’s milk will keep your moon milk classic and offer you a creamer, richer consistency and flavor. Almond Milk: With almond milk, your moon milk will get a nice nutty flavor. 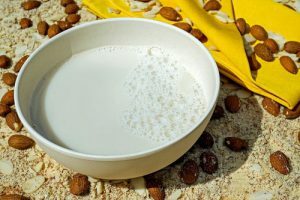 Nut milk is so easy to make and this is our favorite! Coconut oil is a true key player in a moon milk recipe. It's said to be a healthy saturated fat capable of helping to protect the brain from degenerative diseases such as Alzheimer’s. It also helps to keep you feeling less hungry and may help you lose weight. Coconut oil has antimicrobial properties and considered useful for maintaining top gut flora balance. The benefits of honey are endless, but we recommend using raw Honey. Because honey comes from plants it has phytonutrients. But these valuable nutrients are unique to raw honey and vanish when the honey is processed. You can also also substituted pure maple syrup for honey. Is Moon Milk Just a Placebo? While all the ingredients in Moon Milk have sleep-inducing qualities, some people believe the effect of Moon Milk is a placebo effect. But really, everything we do has some level of placebo effect. Whether it is going to see a doc, meditation, or drinking Moon Milk, when we believe something works, our biochemistry changes to support it. The key to health though is creating healthy habits and rituals which will help us to stay in sync with the natural cycles and rhythms of nature. So then, if an aromatic, warm drink is your cue for you to relax and get a good night’s rest, then moon milk is really and truly worth the try. Or for ease, try adding Ojai Nightly tonic + 1 tsp of Turmeric to your warm milk. Instead of the classic warm milk to help you sleep, dial it up a notch and make some Moon Milk. 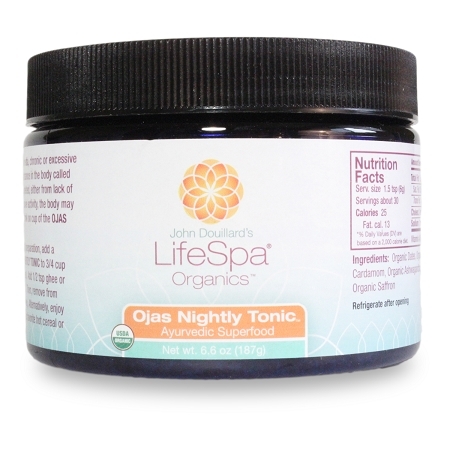 It's a delicious natural sleep aid made with Ashwagandha that can help you de-stress and relax. A core principle of Ayurveda is to find harmony for the mind, soul, and body and that means that good sleep is very important to achieve that. If you are wondering where you get high-quality organic Ashwagandha, I feel good about recommending this one, because I use it all the time. Thank you for such a wonderful post about Moon milk.To tell you the truth i was attracted by this name and i decided to pass through this post. I am amazed by the way it is prepared and its importance to health.Most of the time we have medicine in front of us but lack of information is the enemy of our knowledge. I will prepare Moon Milk myself as i have all ingredients here. Thank you so much .Is there some mixed ingredients which are available at market? wow I learn something new everyday, I’ve never heard of moon milk before but it sounds absolutely delicious tbh. I’ll give this a try with my girlfriend, she’ll definitely like this. I also didn’t know that you could ingest coconut oil, I thought it was only meant for your skin. does it add any extra benefits? I think I’ll try it first without the coconut oil, but I’m sure it’ll taste just as good. Moon milk, didn’t know I was actually taking it. I am a fun of cinnamon flavored milk but have never considered what benefits it has on my body. I just take it because it is a good night drink before sleep and always makes me feel good and have a good night sleep. Now I know why, is it a good idea to give this moon milk to children for the health benefits? Hi Anita, If you want to 10x the health benefits of your cinnamon drink, add all the other ingredients listed here! Enjoy! Jackie, I do thank you for this very interesting post. I have never heard of “moon milk” before but I do want to try it, I think. The only thing that concerns me is what appears to be a form of lactose intolerance that affects me when I drink too much milk. Would it work with coconut milk, do you think? Hi Netta, If you have an adverse reaction to cow’s milk, make a nut or grain based milk. They are so easy to make: https://motherofhealth.com/hea… Yes, coconut milk is perfectly fine. I am loving incorporating adaptogenics in my every day routine. Every time I think, “where have you been all my life!” Of course, I’ve never heard of this recipe, but I cannot wait to try it! I will be doing that tonight as thankfully I already have the ingredients . Do you happen to have a recipe similar, but one that is for mornings? I usually use a concoction with lions mane, but I’m always looking for something new. Hello Jackie, Moon milk is new to me although I did know that warm milk helps one sleep. I really am so pleased you put the recipe in and I have especially bookmarked it as will be trying it out. I have pills to help me sleep and can’t bear taking them as am sure they are not doing my liver any good at all. Having a natural remedy would suit me much better. Natural health care has always been used in our family. Love that there is cinnamon and tumeric in the recipe as I find these are used in a lot of my cooking. Will look for Ashwagandha as I am sure will find it here in South Africa. Thank you for this very interesting and am sure helpful post. There’s a ton of information here to “digest” (pun intended, though perhaps many of the things you listed are absorbed, not digested?). I never heard of ashwagandha or ayurveda. Do I understand correctly that ashwagandha is IN ayurveda, or when taken together it promotes the things you noted? I have no problem going to sleep or staying asleep, but I do have joint pain so I’ll be experimenting. Thanks for the in-depth article with so many options. Ashwagandha is a widely used adaptogenic herb in Ayurveda. https://motherofhealth.com/the… Hope that helps. I have never heard of Moon milk before, but it really does sound a great idea. I just wondered which other adaptogens you would recommend which are equivalent to Ashwagandiha? And if so, would those also be good for the thyroid function? Ashwagandha does seem very expensive, although I would like to try it through Thrive Market. Do you know if they ship to the UK, and are the shipping charges very high? I really want to try this Moon milk, and I love the sound of the other ingredients too. I am a great believer in using Turmeric. It does sound really delicious and it is obvious that it is good for you. Thank you so much for a really fascinating and informative post. While Ashwagandha and Shatavari are my go-to adaptogens, Amalaki, Astragalus, Bilberry, Elderbery, Ginseng, Guduchi and Holy Basil are all wonderful too! Depending on the person and condition would dictate which one will work best. I believe Thrive Market only ships in the USA. I hope you love the Moon Milk. Please come back and let me know? 🙂 Take good care! Thank you very much for this recommendation. The term “Moon Milk” is starting to become popular. And I had heard part of these benefits, but it has been reading your post that I have come to actually grasp all that is involved in Moon Milk: Healthy sleep being one of the key benefits. Thank you very much for the suggestions concerning adding some super-foods, and the other blending ideas. I’m grateful I found this post! Hey Henry, So many of us have adrenal fatigue these days. I’ve found Moon Milk a nice way to end the day, support my adrenal glands and get a good night of sleep. Thanks for taking the time to read the post and connect.